If you’ve ever set foot in the Sandbar, you know we love fish. And we love fish movies. “Finding Dory” was a fun movie, and we highly recommend it. Here’s the best part: you can get free tickets to see it at the world’s oldest operating cinema in Ottawa! Spend $20 at the Sandbar Sub Shop in downtown Lawrence this from now through June 25, and you’ll get two movie and museum passes. FOR FREE. It’s just a short drive south to Ottawa, and you’ll be supporting a wonderful family-owned business. Also, subs are half-price after 5 p.m. this summer, so bring the whole family or a bunch of friends in for dinner! Boots? Check. Cowboy hat? Check. Old West spirit? Check. Aficionados of all things western will celebrate the return of Old West Cowboy Days after a six-year hiatus during a day-long festival Sept. 5 in Ottawa, Kansas. 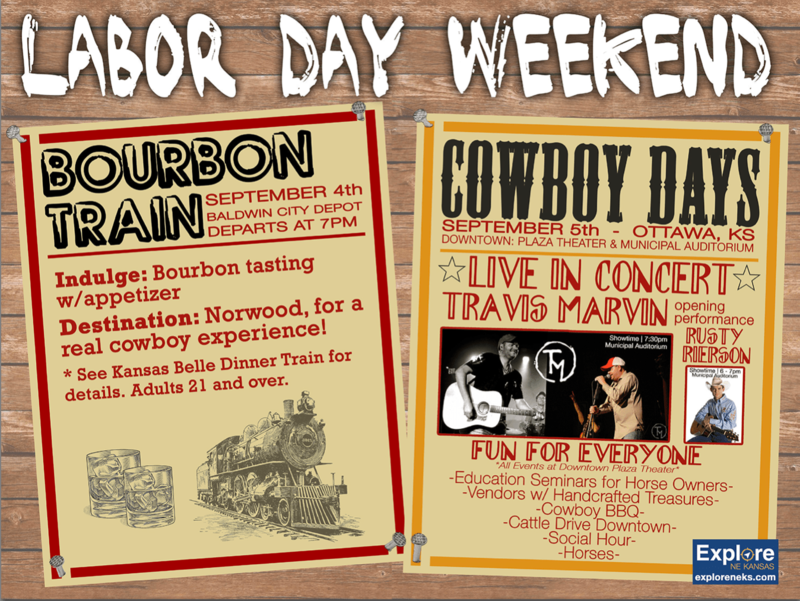 A kick-off to the event is the Bourbon Train ride on the Kansas Belle Dinner Train at 7 p.m. Sept. 4. Passengers will ride from Baldwin City to Norwood while enjoying five unique bourbon tastings and appetizers. They’ll also experience an old-time wagon ride and a roaring campfire with a Western theme. For more information and to make reservations, contact the Kansas Belle Dinner Train at (785) 594-8505. Want to see dozens of Longhorn cattle being driven down Ottawa’s Main Street? Don’t miss the cattle drive at 10 a.m. Sept. 5. The drive is sponsored by the Plaza Cinema and Burkdoll Brothers of Garnett, Kansas. Activities around the city of Ottawa include an exhibit at the Old Depot Museum, 135 W. Tecumseh St.; western movies and a Buffalo Bill exhibit at the Plaza Cinema, 209 S. Main St.; a shooting presentation by the Lebo 4-H club at The Gun Guys, 412 S. Main St.; and carriage rides throughout downtown Ottawa. The night will conclude with performances by the Travis Marvin Band and Rusty Rierson, plus recognition of the Kansas Cowboy of the Year, all at Ottawa Municipal Auditorium. Don’t forget to follow the festivities on Facebook at Ottawa Cowboy Days and on Twitter @Ottawakscowboy. Use hashtags #ottawaks and #ottawacowboy throughout the day! For more information and a complete schedule of events, visit www.explorenekansas.com. Our founder Peach also owns the Plaza Grill and Cinema in Ottawa, a movie theatre-slash-bar and grill that's been renovated into a great place to spend the evening. In addition to showing the latest and greatest movies, the cinema also features live comedy, concerts and other events. This Saturday night, January 5, is another opportunity to enjoy a live comedy show with Mike Baldwin and Jim Stout, followed by a concert by local country musician Travis Marvin. Tickets are just $15 for the entire evening, and there's only room for 100 people. The comedy show starts at 8 p.m. and you must be 18 or over to attend. This is a great deal. Only $15 for TWO comedians, plus a concert? You can't beat that anywhere! Check out the Plaza Grill and Cinema's website and Facebook page. You may or may not know that our founder, Peach, also operates the Plaza Grill and Cinema in Ottawa. It's an old, historic movie theater in the downtown district that she has renovated over the past few years, and now in addition to showing movies, it's also a bar and grill. Not unlike the Alamo Drafthouse. Anyway, the Plaza Grill has a special event coming up: a live comedy show. You're invited to join us on Friday, October 5 for the show featuring the Fryman and Chris Smith. The Fryman is a twenty year veteran of the stage, as well as a national recording artist with Laughing Hyena Records. He has appeared on NBC and he is also one of the only white guys to appear on BET's Comicview. He has also done three military comedy tours overseas for our troops and can be heard regularly on Sirius/XM satellite radio. He's also a former marine who originally hails from Keflavik Iceland, but now chills in St Louis. He has performed in over 40 states and more than 250 cities and towns in the United States. Feature act Chris Smith also hails from St. Louis. With an intelligent delivery and thoughtful material, this comedian is always entertaining and never offensive. Adept at reading a crowd, he always finds the right material for the right situation. Tickets are just $10. A bar and full menu will be available for the event. Tickets are available at the Plaza Grill and Cinema in downtown Ottawa, or you can call 785.242.5555 to purchase tickets over the phone. We hope you'll join us for a night out in Ottawa! Are you looking for something fun to do on family night? A new option for date night? Don't want to drive to Kansas City for dinner and a movie at one of their snazzy movie theaters? Check out the Plaza Grill and Cinema, just a short drive south of Lawrence in Ottawa. Sandbar founder Peach bought the historic movie theater in Ottawa several years ago and has renovated it. Today, the theater has two big screens and also houses a restaurant. Every Monday is dinner and a movie night. For only $9.99, you can enjoy dinner from the extensive menu as well as a movie. There are daily matinees for just $5.75 per ticket before 7 p.m., and on Tuesdays you can get matinee pricing all day. Senior citizens can enjoy $5 movie tickets all day on Wednesdays. You can also rent out the theater for parties or other events. Click here for movie specials. For those of you looking for a great date night, check out the Prime Rib Fridays. For $15 per person, you can enjoy a prime rib dinner and a movie. If you don't have time for a movie, you can still stop by for something to eat. The grill is open from 11 a.m.-9 p.m., Monday through Thursday, noon-11 p.m. on Friday and Saturday, and noon-9 p.m. on Sunday. Click here to see the menu. Catering options are also available. Ottawa is a great little town and it's a short drive. Try something new and check out Peach's theater! This is where we go every Halloween for our Rocky Horror Picture Show extravaganza. Maybe one of these days we'll put together a bus trip for dinner and a movie? You can also keep up with the Plaza Grill and Cinema on Facebook and Twitter.